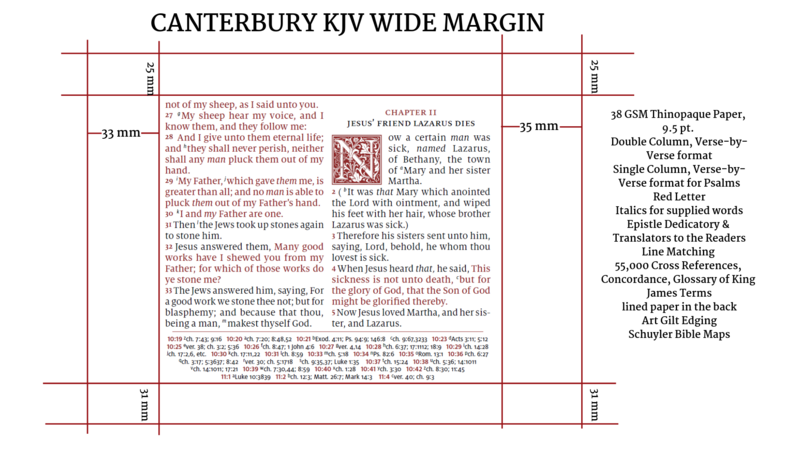 The best selling Schuyler Canterbury KJV Bible will soon come in a Wide Margin format. We expect to have these in late summer. This Bible will be identical to the current Canterbury KJV Bible, with the following exceptions: 1. Slightly smaller text size: 9.5 instead of 11 point font. 2. Red letter text for words of Christ. 3. No ‘self pronouncing’ text markers 4. Heavier paper – 38 GSM Bible paper. 5. Semi-yapp cover. 6. Last, but not least, wide margins. Outer Margin: 35 mm; Inner Margin 33 mm; Top Margin: 25 mm; Bottom Margin: 31 mm. This format will extend to the Schuyler Quentel series. To see this in a PDF format – click here. (to see ‘real size’ you may need to save the file, open with adobe, print at ‘actual size’ with orientation set to portrait) If you are thinking about purchasing one, please participate in our color survey. Goatskin Colors: Black, Antique Marble Brown, Imperial Blue, Slate, Dark Green, Firebrick Red. Calfskin: Black.